CONSIGNED TO THE 2018 ROCKY MOUNTAIN SELECT SALE-- THIS 80" TTT COW AT 6 YEARS IS THE TOTAL PACKAGE -- BIG FRAMED,GREAT MILKER,EASY GOING AND GREAT PRODUCER. HER LAST 2 HEIFERS HIT 55"AND 60" AT 24MONTHS. WE ARE KEEPING ONE FOR REPLACMENT ; THE OTHER SOLD FOR $19,000 AT THE 2016 FT WORTH SALE. SHE HAS BEEN EXPOSED TO RC TSUNAMI 2 AND GLR CORONADO . UPDATED PREGNANCY INFORMATION TO BE GIVEN AT SALE TIME. CONSIGNED TO THE 2018 Struthoff " Deep in the Heart of Texas " Sale –OCV’d.This cow was the high seller at the 2014 Millennium Futurity--$16,500. She is a big bodied, total package cow with 4 ancestors over 80" TTT--LLL Erica, BL Awesome Blossum (87”) , Creekmore's Awesome and LCR Buena Joya. Her sires include Cowboy Chex and Coach on top and Boomerang and Emperor on the bottom. Her color and conformation speak for themselves. She had a beautiful CV Cowboy Casanova heifer that we are keeping for replacement. She is exposed to GLR Coronado (Archer Texa X Mint Julep)for a 2018. Current measurements and updated pregnancy status to be given a sale time.Go to www.gillilandranch.com for additional information. CONSIGNED TO THE 2018 ROCKY MOUNTAIN SELECT SALE--OCV'd. 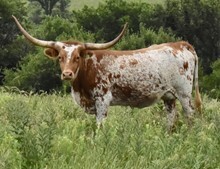 This colorful total horn cow (72'' TTT) was purchased from Richard Filip. Her pedigree includes LLL Maximilion, PCC Horizon, Maximus ST and Horse Head Show Time. She was AI'd to Hubbell's 20 Gauge on 11/5/17 and confirmed pregnant initially in December 2017 . She was the turned out with RC Tsunami 2. Repeat blood pregnancy test was inconclusive in March 2018. Veterinarian palpation on 5/24/18 revealed she was 5-6 months pregnant. The calving date will determine the sire. If she calves by sale date, it will be a 20gauge heifer. If she calves in late September, the sire will be RC Tsunami 2. CONSIGNED TO THE 2018 ROCKY MOUNTAIN SELECT SALE-- OCV'D.This young cow is a combination of the $100,000 CV Cowboy Casanova (84" TTT) on top and JR Grand Slam breeding on the bottom( 5 ancestors over 80" TTT). 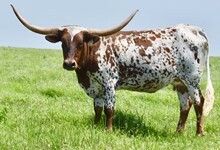 She is big bodied, stands out in the pasture and breeds back quickly. 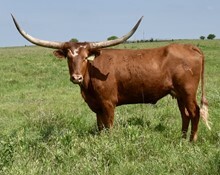 Her horns are rolling out and should reach high 70's at maturity. We are keeping her RC Tsunami 2 heifer for replacement. She is confirmed bred to Tsunami again for a repeat performance. Go www.gillilandranch.com for updated pregnancy and measurement information. CONSIGNED TO THE 2018 ROCKY MOUNTAIN SELECT SALE--OCV’d.This flashy young cow is correct in every way and will make her mark in your program. She is easy to handle and comes with an outstanding pedigree. Her sire is the $100,000 CV Cowboy Casanova and her dam Cactus Rita has the same dam as as RII Lady in Red, Jamaka Beach and Jamaica Cruise— all of them pushing 80” TTT and over. 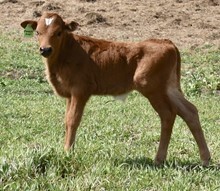 She had an RC Tsunami 2 bull calf (Concealed Weapon X Pacific Mermaid) in June that will be at side (see below). 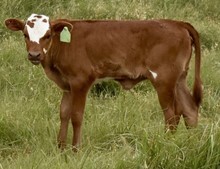 That bull calf has 9 ancestors over 80" in his pedigree. She is left open to breed to your bull of choice. CONSIGNED TO THE 2018 ROCKY MOUNTAIN SELECT SALE- OCV'd. 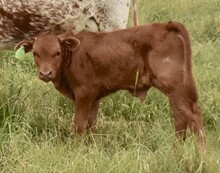 This flashy heifer combines the genetics of Cowboy Chex, Hunts Command Respect and WS Jamakizm with the added highlight of Dixie Creole to produce twist. 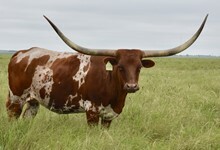 She is tall, big bodied and horns are going back hard. We are keeping her RC Tsunami 2 (Concealed Weapon X Pacific Mermaid) heifer for replacement. She bred right back to Tsunami and produced another heifer baby on 6/6/2018 who will be at side at sale time.That heifer has 9 ancestors over 80" in her pedigree (see below). 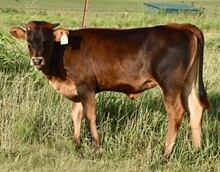 STICK AROUND FOR THE LAST COW IN THE SALE #87-- SHE IS WORTH IT!! CONSIGNED TO THE 2018 ROCKY MOUNTAIN SALE-- OCV'd. THIS YOUNG HEIFER HAS BEEN A GREAT PRODUCER FOR US. HER PEDIGREE INCLUDES 4 ANIMALS OVER 80" TTT( WS JAMAKIZM, ZD JAMADAN ,STARLIGHT X 2). SHE IS A 3:1 WITH A JBR ECLIPSE HEIFER AT SIDE AND BRED BACK TO GLR CORONADO. 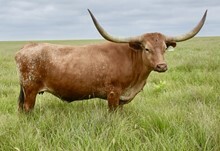 CONSIGNED TO THE STRUTHOFF " DEEP IN THE HEART OF TEXAS" SALE This young cow has great color ,conformation and an outstanding horn pedigree with Monaco Chex (JP Rio Grande X Lady Monika BL) on top and Cowboy Chex , Hayseed and Chuckwagon on the bottom. Her sire Monaco Chex comes loaded with bull and cow power. 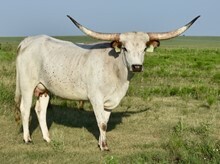 The grandsire JP Rio Grande is an elite bull in the industry producing countless 80” TTT progeny. Lady Monika BL has produced BL Monika 645 (90” TTT), BL Lady Grate 982 (80.75”TTT) and BL Rio Monika 715(78.5”@6 years), JH Monikaʼs Sun ( 68 7/16”@20months )and JH Rurally Screwed (70” TTT at 24 months). Other horn producing superstars in her pedigree include Tari Graves FM 49 x3 (81'') and Starlight (86").She comes with a GLR Coronado (adds WS Jamakizm, Top Caliber and Texana Van Horne to the pedigree) bull calf at side and should be bred back to him for a 3:1.